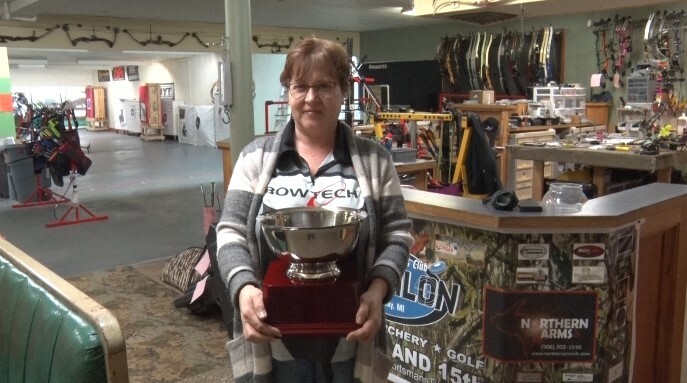 ISHPEMING — Two local archers recently competed in the National Field Archery Association Indoor National Championships last week, and one walked away a champion. Held in Cincinnati, the Indoor National Championships drew more than 1800 archers from around the world. The competition separates competitors into different categories based on age, gender, and type of bows that are shot. The competition showcases competitors and shows that all different types of people from around the world can come together in archery. Shelley Saxwold and Mindy Schmidt both competed at the competition in different divisions, with Saxwold winning the Freestyle Senior Female division with a perfect score over the two day competition. Schmidt came in 11th in the Freestyle Adult Female division, missing a perfect score the first day by just 1, but she rebounded for the second day. Schmidt also says that Saxwold has been her mentor, and is happy that she was able to celebrate her winning with her.